Create stunning videos that beg to be watched again and again. Add professional style and energy with transitions, titles, and video effects. Easily upload your finished movies on YouTube and Facebook without leaving the application. Capture your world and share it – with Movie Studio. Smart phones make it easy to make movies. Movie Studio makes it even easier to make those movies great. With a streamlined workflow, powerful editing tools, and a vast array of video and audio effects, the art of moviemaking is right at your fingertips. Add titles, music, and transitions. 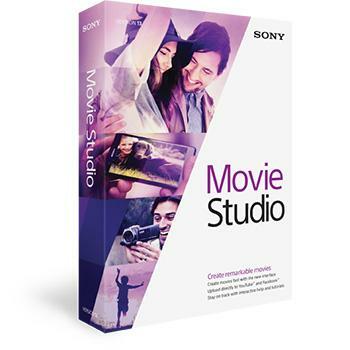 Movie Studio offers all the tools and features you’ll need to put your masterpiece together, fast. Create movies on a touch PCAdd animation to textStabilize shaky videoCreate picture-in-picture effectsAccess hundreds of transitions, filters, and effectsShare movies and slideshowsPublish videos directly to YouTube and FacebookSIMPLE EDITINGWith a clean interface and a streamlined workflow, making movies is easier than ever. TOUCH SUPPORTMovie Studio is touch-enabled, so ditch the mouse and put a movie together on your Sony VAIO Tap device. SHOW ME HOWStart creating right away by working with the Show Me How tutorials. Choose a topic and watch as we show you how, step by step. Movie Studio is built on award-winning Vegas technology used in movie studios and broadcast facilities around the world. Minimum System Requirements: Microsoft Windows 7 32-bit or 64-bit or Windows 8 32-bit or 64-bit (including Windows 8.1) 2 GHz processor (multicore or multiprocessor CPU recommended for HD or stereoscopic 3D) 500 MB hard-disk space for program installation 2 GB RAM (4 GB recommended) IEEE-1394DV card (for DV capture and print-to-tape) USB 2.0 connection (for importing from AVCHD, XDCAM EX, NXCAM, or DVD camcorders) 512 MB GPU memory Windows-compatible sound card DVD-ROM drive (for installation from a DVD only) Supported CD-recordable drive (for CD burning only) Supported DVD-R/-RW/+R/+RW (for DVD burning only) Supported BD-R/-RE drive (for Blu-ray Disc burning only) Microsoft . NET Framework 4.0 SP1 (included on application disc) Apple QuickTime 7.1.6 or later for reading and writing QuickTime files Internet Connection (for Gracenote MusicID Service) Supported Formats Import: AAC, AA3, AIFF, AVI, BMP, CDA, FLAC, GIF, JPEG, MP3, MPEG-1, MPEG-2, MPEG-4, OGG, PCA, PNG, QuickTime, SND, SFA, W64, WAV, WDP, WMA, WMV Export: AAC, AIFF, AVC, AVI, BMP, FLAC, JPEG, LPEC, MP3, MPEG-2, MPEG-4, OGG, PCA, PNG, TIFF, QuickTime, W64, WAV, WDP, WMA, WMV Contents: Application DVD includes Movie Studio 13.0 software (language options available: English, French, German, Japanese, Spanish, Russian, Polish). Import video and photos directly from mobile devices and popular cameras. Select specific clips or import them all. Create the perfect sequence. Rearrange clips on the timeline with a simple drag-and-drop. Choose from over 500 special effects to make your movie look unique. Apply the green-screen filter, reduce red eye, restore white balance, and more. Produce the perfect soundtrack. Import music from CDs, MP3s, or record audio directly into the program. Customize your movie by adding text, credit rolls, and animated titles throughout your project.